HSMAdvisor 0.018 is avilable for download. First of all we have a new feature. It is Machine Profiles now users can maintain their own machine types. 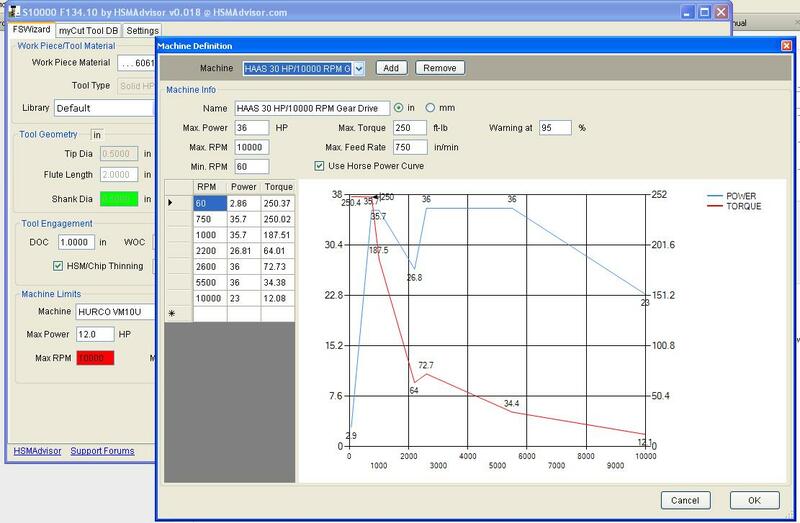 Inside machine profiles users can specify machine power curve that allows to warn user if power required to make the cut is outside machine power curve. Serial Key bug that caused some keys to malfunction and not recornise by the program. Some security software do not allow to download unsigned installer files or they do not allow to download any executable files at all. As a result some users will have trouble downloading and installing my software. As a fix you can try to download this ZIP package that does not require installation. HSMAdvisor is not signed with Microsoft because i am not a "recognized by Microsoft publisher"
So Windows may give you a warning explaining the "risks associated with running unsigned software"- kindly disregard that message and click "allow"
Below is a walkthrough on how to allow installation on Windows 8 platform. I have just released HSMAdvisor build 0.017! Get it in DOWNLOAD section of the web site. First you should uninstall the previous version. After downloading and installing it you will receive another 30 days to play with my software. HSM Cutting speed compensation now only turns on when HSM/Chip Thinning is checked. Huge number of bugs fixed. Enjoy and don't forget to leave your feedback. You can do so support forums. Forums are located at http://zero-divide.net/index.php?page=forums&shell_id=170&category_id=1123, a simple registration on my web site (zero-divide.net, register) allows you to post your questions/feature requests/suggestions. Need i remind you that registered users who actively participate get full version for FREE!